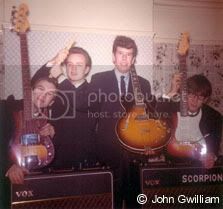 The Scorpions were active from 1963 through 1966 during which time they played at many venues throughout the West Midlands. Most of the line-up were from Kidderminster but because their manager Stan Hill and his son Martin (who was the band’s drummer) lived in Kinver, The Scorpions were known as a Kinver based group. 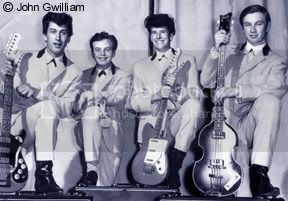 Stan Hill also came up with the band’s name although it was not a popular choice at the time according to bass guitarist John Gwilliam; “We would have preferred something else, but he owned the name so like it or lump it, the name was staying!” says John. The band’s performances included many of the popular “covers” of the day, but as all the members could sing, they were able to include some of the more challenging material for their 4-part harmonies. These included songs by The Beatles, Beach Boys, Hollies, Searchers, Ivy League etc. as well as 1950s rock ‘n’ roll which included many songs by Buddy Holly and also instrumentals by The Shadows. The Scorpions played just about every venue in the area – big to small church halls from Worcester, Wolverhampton, the Birmingham area and all stops in between. Dudley, West Bromwich, many private parties in Brum (“they were an eye opener” says John), The Birmingham Tennis Club and Brum Children’s Hospital Nurses Night were both popular and regular bookings for the band. John Gwilliam also recalls an occasion where The Scorpions were billed as the “Feature Band” with a hot act from Wales called The Silverstone Set as their support (the band included future Sweet guitarist Andy Scott and Love Affair vocalist Gus Yeadon). “This was at West Brom town hall. We were booed off in the first 15 minutes – only to stand aghast and watch the support band do such a superb and professional set”. John Gwilliam still has many happy memories of those days; “Something that never failed to amaze me was the endless number of club venues that materialized in some of the most out-of-the-way places. We got to play in places we never knew existed! This truly was a golden era – I wish my kids could experience the same”. John now lives in Australia but will never forget his time with The Scorpions during those days when the “Midland Beat” newspaper claimed there was more than 900 known bands working in the area. and to John Gwilliam for assistance in writing this bio. Love you guys forever! I never dreamed you all existed back i n the 60’s.So cool, you are one of my favorite bands along with UFO. SCORPIONS keep the world rockin’ and the peace and love flowing.Will be watching for your next states tour and stop in LEXINGTON,KY. ROCK ON!